cleadew GP can be used safely because the compatibility test for orthokeratology lenses* has been conducted. Wash your hands well with mild soap before handling your contact lenses. • Place the lenses into the case’s lens holders. • Close the case lid on one side, put a neutralizing tablet in, and fill up to 90% of the case with the orange disinfecting and cleaning solution. • Close the lid on the other side tightly. • Soak the lenses for over four hours (or overnight). • Confirm that the lenses and the solution are clear before wearing them. 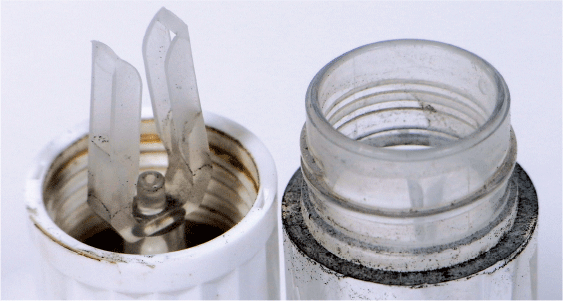 • Open the lid on one side and discard the solution in the lens case. • Shake the case to rinse the lenses well. Remove the lenses from the holders and wear them. After the care of the lenses is completed, wash the lens case with saline solution and allow it to air dry. the contact lenses might become discolored. Care for contact lenses using cleadew GP according to usage, and store the case at room temperature with the lid closed. Rinse the contact lenses thoroughly with rinsing solution while in the case before wearing them. * Avoid storage of contact lenses in the storage case containing only liquid agent for cleadew GP. * If contact lenses are to be stored for a month or more, care for them at least once a month using cleadew GP. For orthokeratology lenses, please use cleadew GP with their specified lens cases. 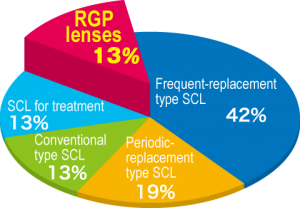 We propose a care solution involving disinfection plus cleaning for all RGP contact lenses! 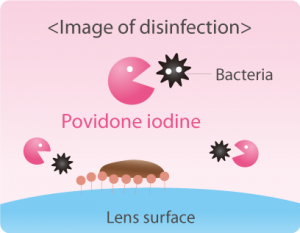 cleadew GP includes a disinfectant, povidone iodine which penetrates the biofilm made of bacteria adhering to the case, and can effectively eliminate the bacteria which cause infection. 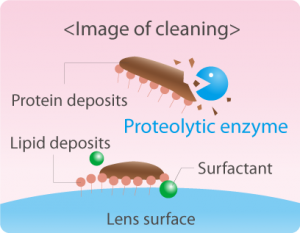 Proteolytic enzyme and surfactant contained in cleadew GP effectively remove deposits comprised of protein and lipids adhering to lenses. cleadew GP is also suitable for orthokeratology lenses with complicated shapes.